Today I am searching for weatherstripping. I think it'll solve some of my most irritating promlems, dampness and mold. Yep today I went out to check on the DeSoto and guess what? There is mold growing in the back window and on the seats. I am so sad... it will come off the seats and the original cardboard in the back window needed replaced with something else anyway, but I feel like everything around here gets moldy, and it seems particularly bad when it's my beloved car. This was my answer to the big family, big car. No mini-van for me, I can haul way more stuff in the trunk of this car than I could fit in a mini-van anyway. Unfortunately we have had a few problems with the car this last year so I have not been driving it, I miss it though and can hardly wait to get it back on the road. Well, it seems I will be able to get weatherstripping for it, last time I looked I had no luck, but today I found 2 places online that have what I need. Now I just need Mr. B to help me figure out what exactly is leaking and if I need to replace all of it or just the doors and side windows. I hope I don't have to do the windsheild and rear window as those are of course the most expensive and not for the DIY gal to undertake. Oh, my God! I LOVE your car! 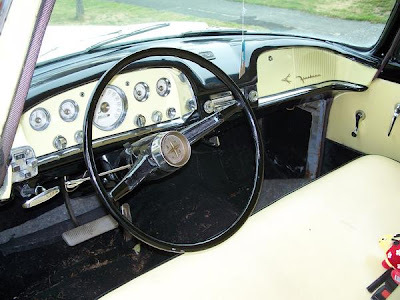 Paisley Penguin put me onto it, since I just wrote an ode to a famous DeSoto on my blog.